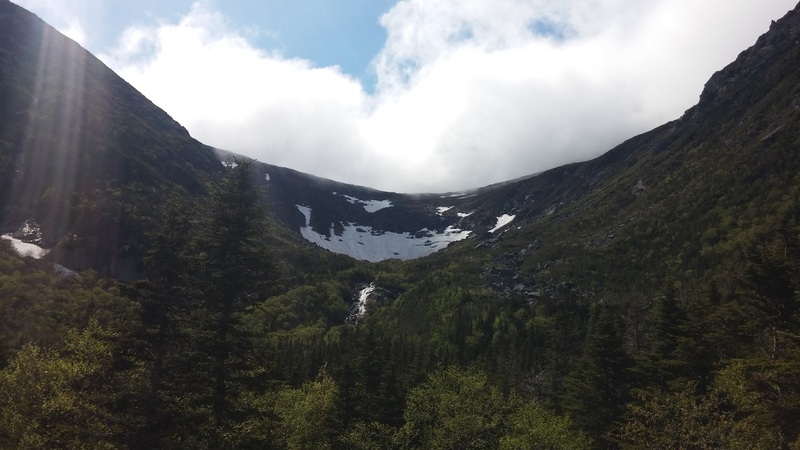 AMC Conditions: The Season of Tuckerman Ravine! The Season of Tuckerman Ravine! For the past three days I have looked out from my desk window (which usually has a satisfying view into Tuckerman Ravine) to showers, driving rain, lightning, mist, and most consistently, clouds. The time spent inside that the weather has facilitated has allowed me to give the cabin a well-deserved spring cleaning, to pick up the ol’ guitar, and lots of time to think. Some of my damp, cabin fever thoughts have revolved around the snow conditions in the ravine after so much rain. It has been fun to predict what the snow coverage will look like without being able to see it. Today, I finally caught a glimpse of what was happening. 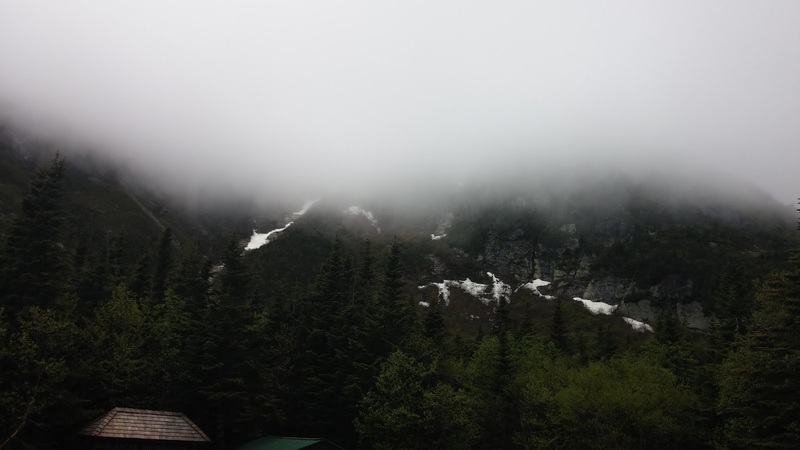 The clouds slowly lifted out of the ravine revealing the remaining snow and the main waterfall pouring its contents over the headwall. The edge of the snowpack has receded a couple of meters and the tracks from last weekend’s skiers and boarders have been washed away. A section of undermined snow has collapsed in the lip area, initiating some ice fall from the same area. Just as I thought! With the added warmth of sunshine on the way for the rest of the week, I would expect to see more of the same. Undermined snow and crevasse openings currently have a strong presence in Tuckerman Ravine. After a few more inches of rain in the past few days, this hazard is even more prevalent. Undermined snow occurs when space is created underneath the snowpack between the snow and the ground. In this case, recent rain water that has penetrated the snowpack through the numerous crevasses and waterfall holes and perpetuates this problem. Be aware that if you are standing on snow, it may not be supported by anything underneath you. The presence of crevasses and waterfalls above a given fall-line usually guarantee undermined snow, but do not limit it’s extent. Crevasses in the ravine are a slightly more visually obvious hazard and should be given a wide berth. These openings in the snowpack are deep and extend long distances under the snow, another hazard perpetuated by high amounts of rainfall. Large ice chunks still exist on the steeper parts of the ravine, and are waiting for the right moment to come down, another thing these few days of rain might help with. This fact always makes me think about and plan my goals carefully and continually observe and reassess what is above me while climbing up my ski run. As a result of these remaining hazards in Tuckerman Ravine, the section of Tuckerman Ravine trail between the floor of the ravine and the Alpine Garden Trail Junction is closed. This closure is an annual occurrence and can extend into Late June or early July. This should not thwart any plans of going to the Mount Washington summit as both the Lion Head Trail and the Boot Spur Trail are both great alternatives for getting above treeline. With traces of winter lingering, skiers and boarders coming to carve their signature into the remaining snow, the increasingly warmer temperatures, and the Alpine Garden blossoming with color, it is a fantastic time to be in the mountains! If you find yourself on Washington’s Eastern slopes, stop by the Hermit Lake Shelter Caretaker Cabin for questions, Snickers Bars, or good conversation. See you out there! As always you can check AMC conditions for the latest report and/or call Pinkham to see what they’re seeing out their windows! They are available by phone at (603)466-2721 every day from 6:30 AM to 10:00 PM or by email at amcpinkhaminfo@outdoors.org. To make reservations at AMC Lodges and Huts, please call (603)466-2727 available Monday through Saturday 9am-5pm.